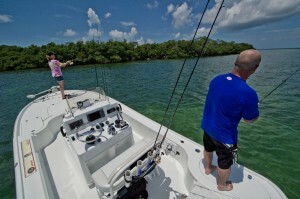 Fishing the backcountry of Key West is arguably the most popular fishing charter. Always calm, waters are crystal clear and the scenery is amazing.. Oh, and you can catch a mess of fish too. Much like flats fishing without the need to be an expert angler. Here at Dream Catcher Charters we started doing backcountry fishing charters to compliment our flats fishing trips. Many times we had anglers that were looking for the following features in a fishing charter not provided in a flats trip. A more comfortable boat to ride in a fish from and still fish the shallows. Hands on more personal experience with the fishing guide. So, we answered all that with our backcountry fishing charters. We added to our fleet Bay Boats that are longer and wider than flats boats. They get in as shallow water and can carry up to 4 persons (we recommend 3 or less). We also opened up our sights on many different species of fish that were much easier to catch and then the smiles showed up with people having the time of their lives casting, reeling and catching fish with ease. We offer 4, 6, and 8 hour backcountry fishing charters that cater to all levels of angler. See our Rates to find out what these trips will run cost wise. We think you will find that backcountry is the best bang for your charter fishing buck. Backcountry fishing offers a cornucopia of fishing. With species such as tarpon, shark, jacks, bonefish, barracudas, cobia, trout, redfish, permit, snook, mackerel, snappers and groupers. Anglers can fish fly, spin, artificial, live bait, soft bait, bait caster or conventional. We have it all and supply it all right here. Drop us a line and we will help you get yours wet..
Our Backcountry Fishing Charters Sell Out In The Spring Every Day.